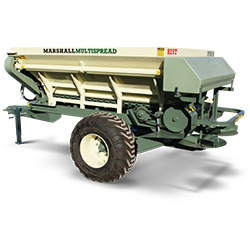 As the demands of modern farming evolve, so does the technology of the tow behind spreader from Marshall Multispread. 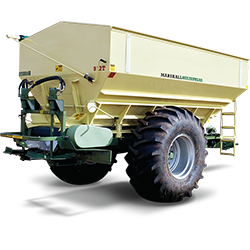 With now over 9000 machines in use in agriculture operations across Australia, the Marshall Multispread tow behind spreader is now the number one selling all-purpose fertiliser spreader on the market. From large dairies to small orchards to broadacre cropping, the Marshall Multispread can spread a wide range of fertilisers in all types of ground conditions. 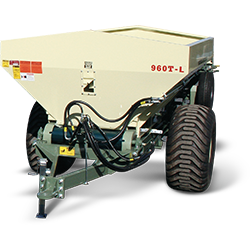 Trailed spreaders are offered for sale in two different configurations; 800 and 900 series. The feed system on the 800 Series machines includes a 2-ply rubber belt attached to a high grade calibrated 10mm chain and drive sprockets, supported by wear resistant nylon skids ensuring a positive drive. The D Type spinner configuration has an overall diameter of 700mm, with four vanes, two short and two long and a stainless steel fertiliser chute for optimum placement of product onto the spinner discs. Spread widths of up to 36m between passes for fertilisers such as Urea, DAP and Superphosphate and up to 14m for non-granulated materials like Lime and Gypsum can be achieved. Minimal adjustment to spinner set-up is required when changing from granulated to non-granulated products. All testing during the development of the D Type spinners was carried out to Australian Industry standards. See the Spinner Technology page for more details. The 2.5tonne trailer model is well suited for smaller farms, vineyards and orchards. 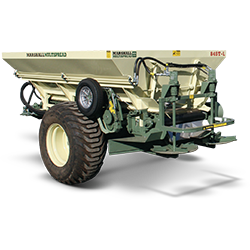 The 4.5 model is the essential tow behind spreader for medium-sized enterprises. The 6 tonne trailer model is the essential tow behind spreader for medium-sized enterprises. 10 tonne trailer models are the ideal tow behind spreader for large farming enterprises. 12 tonne trailer models are the ideal tow behind spreader for large farming enterprises. 14 tonne trailer model suited for large farming enterprises. belt tracking, troughing rollers are fitted inside the chassis and a crowned front pulley is used for quick and easy adjustment. The 4.5 tonne trailer model is the essential tow behind spreader for medium-sized enterprises. 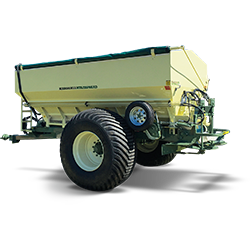 The 10 tonne trailer model is the ideal tow behind spreader for large farming enterprises. The 12 tonne trailer model is the ideal tow behind spreader for large farming enterprises. 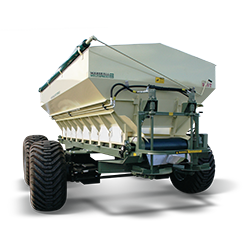 The 16 tonne trailer model is the big spreader for big farms and contractors.